From inception, Volans has strived to span the yawning divide between current approaches to sustainability and what’s needed to create a truly sustainable future for all. Inspired by the flying fish, Piscis volans, and other creatures with the surprising gift of flight, our aim is to make great leaps in progress, achieving breakthrough change. 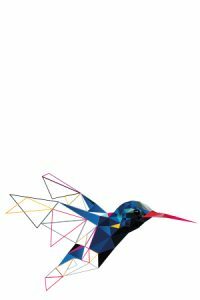 Our adoption of the hummingbird (here designed by Brazilian Silvio Rebêlo) as our icon honours the extraordinary design of the bird, symbolising the growing potential of biomimicry in designing future materials, products, processes and economies. Apart from being a key pollinator, the hummingbird symbolises such things as mental clarity, focus, joy, fertility, the cycle of life, and optimism. 2008: Volans launches with The Power of Unreasonable People at the 2008 WEF Annual Summit in Davos, where it is handed to 3,000 participants. Co-authored by Volans co-founders John Elkington and Pamela Hartigan, the book (published by Harvard Business Review Press) powerfully shapes the evolving debate on social innovation, entrepreneurship and impact. 2012: Our Breakthrough Capitalism Forum in London signals a more radical change agenda — and heralds a new era of disruptive business. 2013: Volans becomes the first UK B Corporation and incubates the B Lab UK organisation in our Bloomsbury offices. 2014: The Breakthrough Challenge, co-authored by John Elkington and Jochen Zeitz, then Chairman and CEO of PUMA — and co-Chair of the new B Team, with Sir Richard Branson (who contributes a foreword to the book). 2015: Project Breakthrough — we launch a joint initiative with the UN Global Compact, with the aim of bringing its 9,000+ corporate members up to speed on the exponential change agenda. 2017: The Carbon Productivity Consortium comes together to develop a 10X approach on climate action. This leads to the New Carbon Economy Inquiry — a Volans-led initiative to advance corporate climate leadership. 2018: The Triple Bottom Line (“People, Planet, Profit”), coined by John Elkington in 1994 and 1995 respectively, are the subject of the first ever product recall of a management concept, published by the Harvard Business Review. Despite significant progress in some areas, the TBL has not yet triggered a transformation of capitalism itself, as originally intended. 2018: Our Tomorrow’s Capitalism Inquiry is now exploring how companies can truly thrive, not in spite of, but because of their commitment to creating value across all three bottom lines.